Life may be a laugh-a-minute non-stop rollercoaster ride of shag-festing and party-going for some people, but for most of us It’s a downright miserable ride on a Number 7 bus with someone smelly next to us and our raincoat making the seat damp. At Jono’s House of Crap we understand what it’s like to be one of life’s losers. Actually, we know what it’s like to be two of life’s losers. Contrary to public opinion, we didn’t become the world’s greatest living Djs through our extraordinary wit and razor tongues. No! We hit the bigtime because we got in touch with our inner selves. We healed the divide between our vastly inflated egos, and our pitifully low public esteem. And now this inner peace can be yours, thanks to the works of Jonai Lama and Russo Maharajah – two of the world’s leading spiritual advisers and tax-evasion consultants. Millions around the world have discovered emotional harmony using the teachings of these remarkable gurus (the millions in question now reside in numbered offshore bank accounts). 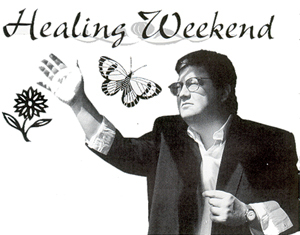 Through an exclusive licensing agreement with Jono’s House of Crap, you too can enjoy the benefits of lighter souls, thinner wallets and well-moisturised skin at our all inclusive Healing Weekend. But don’t take our word for it. Hear what the rich and famous have to say! Upon your arrival at Winton Hall you will slide off the shackles of your pitiful, grubby little lives and enter an oasis of tranquillity and personal discovery. Our series of workshops are individually tailored to expose (and then cure!) your deep neuroses and irrational sexual hang-ups. Guests are reminded that all they need bring is their Gold Amex card, some loose, see-through clothing and at least two bottles of scented baby oil. The taking of photographs is strictly forbidden, as we do enough of that ourselves. Relive the heady excitement of your teenage sexual experience as we bundle in the back of a Ford Capri and let you out in the dark. Get caught by ‘irate parents for a small additional fee. Useful intro ‘Got My Girfriend Pregnant And Buggered Up My Life’ group discussions. Are you dealing with rage and anger at forced to deal with your rage and anger? Bitten off more than you can chew? Try the survivors survivors course. Guest speakers Michael Tyson and Gloria Gaynor. You’ll never find equilibrium or inner peace if your plumbing’s bunged up. Colonic Irritation is this year’s in (and then swiftly out again) thing. Our expert practitioners have experience, some having for operatives with Dyno-Rod, and use specially designed equipment culled from top of the range domestic appliancess. Delightfully refreshing. Light the joss stick, man. Skin up and chill out. Like, don’t hurt the trees, right? Oh man, it’s so obvious, buiId more roads and more people drive cars. Er, Thai I think. The legendary figure of lonai Lama is roundly recognised as the driving force behind the resurgence of New Age philosophy. He’s more usually recognised as the driving force behind the wheel of one of his 178 vintage Rolls Royces. These he has acquired as an ironic symbol of the world left behind in search of spiritual happiness.